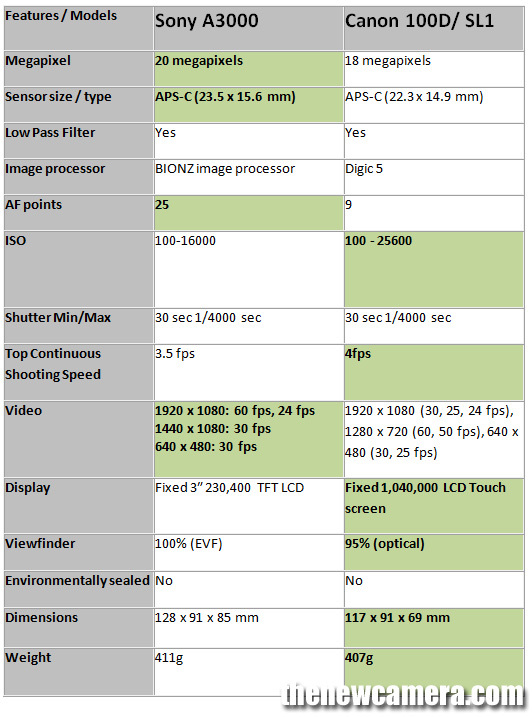 More Megapixel and Bigger Sensor Size: Sony A3000 features more megapixels and bit bigger sensor size compared to Canon 100D. Better low light performance with Canon 100D / SL1 – The Canon 100D features more ISO range compared to Sony alpha a 3000, the ISO range of Canon 100D is upto 25600, Sony alpha a 3000 is limited to 16000 only. Advance AF system of Canon 100D / SL1: EOS Rebel SL1 you’ll get Hybrid CMOS AF II, perfect for shooting photos and video in Live View. Combining two different kinds of AF – phase and contrast detection, Sony A3000 features contrast AF system only. More AF Points in A3000: Sony alpha a 3000 have More AF points Compared to Canon 100D, hence you get more area under coverage with Sony alpha a 3000. Top Continuous shooting speed: Canon 100D features fast shooting speed compared to Sony alpha a 3000. Video: Sony A3000 features better video mode Full HD @60FPS Compared to Canon 100D / SL1 Full HD @ 30fps. Display: Canon 100D / SL1 features Touch Display , better than 100D / SL1. Canon 100D features optical viewfinder and Sony A3000 features EVF, I prefer Canon 100D optical viewfinder over A3000 Electronic viewfinder. Price Difference: Canon 100D / SL1 is will cost approx 2X more compared to Sony A3000. Verdict: Based on Specification Comparison we recommend you to buy Canon 100D / SL1, but if you are looking for affordable solution we recommend you to buy Sony A3000.